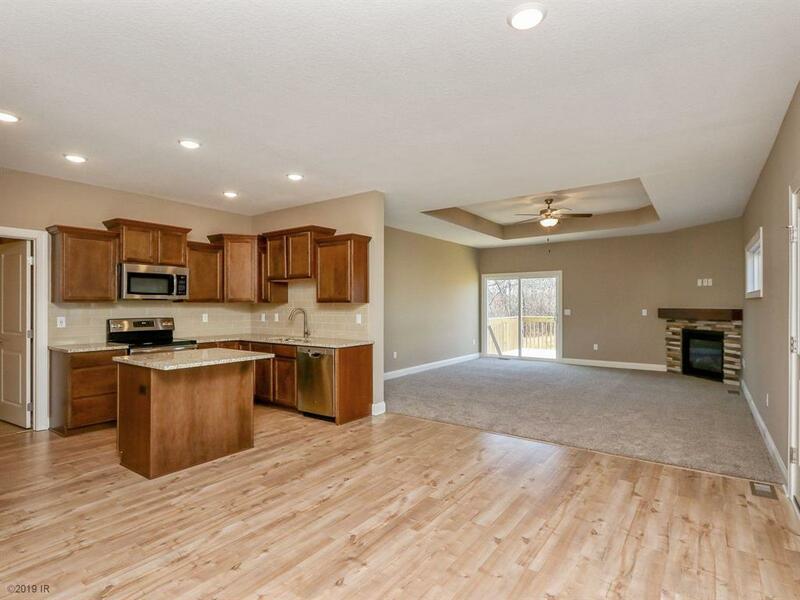 Get rid of the lawn mower and snow blower and have more time for the important things in life in this Hubbell Homes ranch walk-out townhome with over 2250 SF of finished space! Open concept main level features kitchen with gorgeous wood cabinets, center island, granite counters, tile backsplash and stainless appliances. Large family room includes a box ceiling, stone fireplace and patio door with access to deck. Enjoy private tree covered lot from deck! Master bedroom has box ceiling and access to master bath with double vanity, walk-in 5 foot shower, linen closet and walk through to master closet. A spare bedroom, spare bath & laundry mud/room complete the main level. The walk-out lower level features 9' ceilings, lrg family room, 3rd bedroom & 3/4ths bath. Snow removal, lawn care, exterior maintenance, lot irrigation all taken care of for you! 5 year partial tax abatement!